Illumination Physics is famous for integrated façade lighting, however that is not all we do. A recent project in Cyprus shows a different side of our activities, albeit with the same focus of project specific custom design. The Radisson Blu Hotel opened its doors to the public in October 2018. 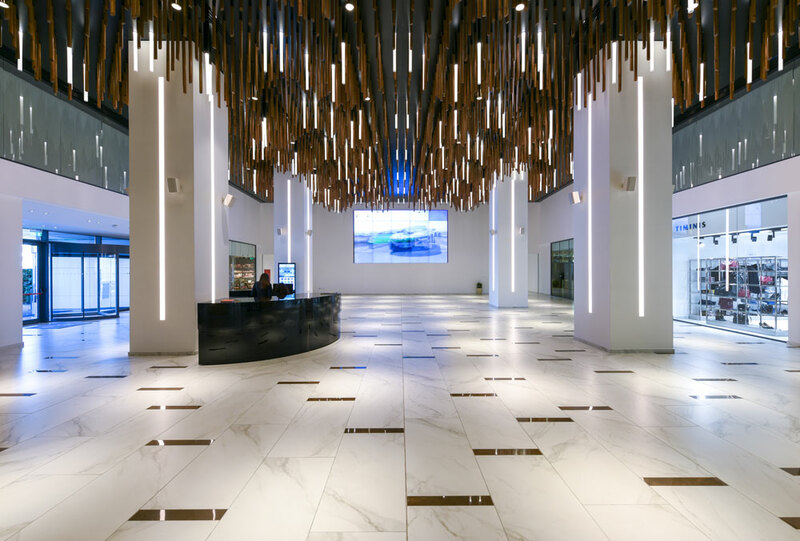 One of the new breed of hospitality venues in the rapidly expanding Cypriot leisure market, this Radisson is actually the first business hotel set in an evolving economy. Grand in both concept and dimension, the chandelier occupies five hundred square metres in two vast displays that occupy the entire ceiling of the mall, surrounding the elevator core and, in turn, surrounded by the retail hub. 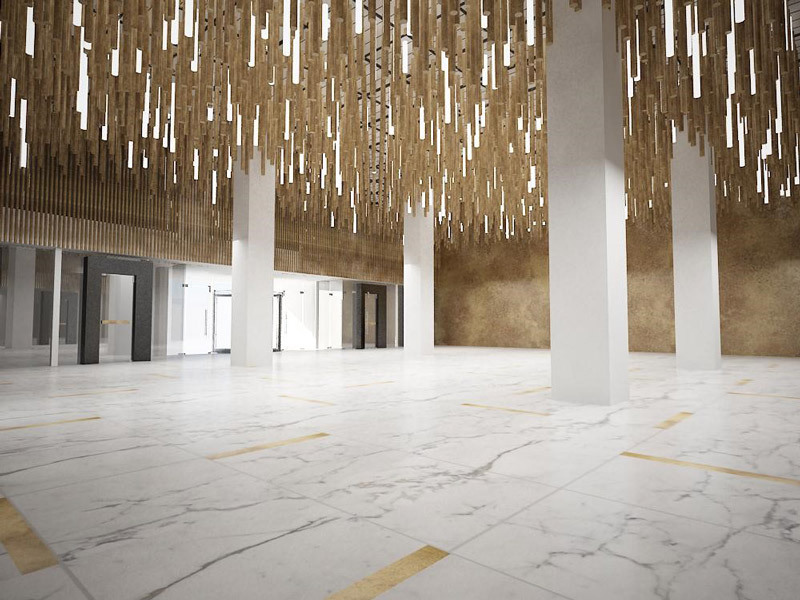 Bold in vision, the chandelier is comprised of pendant polished hardwood elements protruding downwardly from the plane of the ceiling in five variable lengths from 0.3 metres to 1.1 metres. The display is comprised of groups of 16 pendants which are repeated. 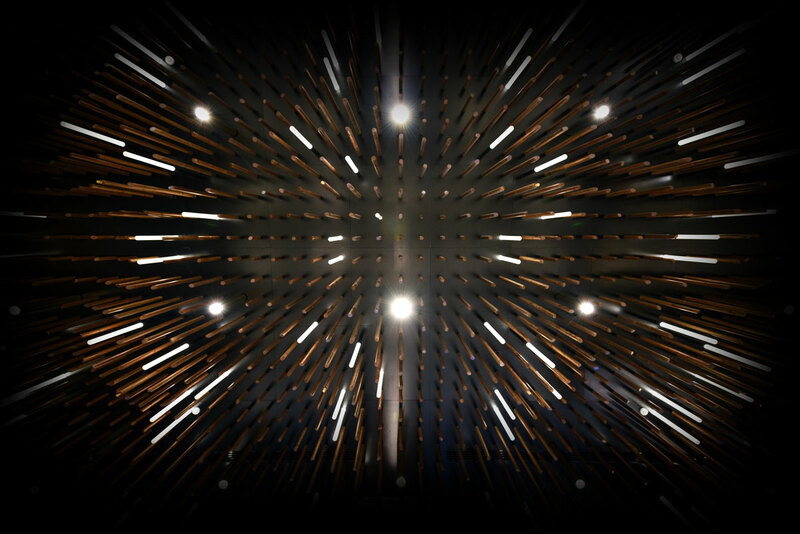 Approximately 10% of the pendants are self-illuminated rods of light in lengths of 700mm lit and 700mm lit + 400mm unlit sections, specially created for the project by illumination Physics. There are 4,032 pendants in total descending out of a matt black sky.